Swimming pools are one of the best ways to enjoy your property in the summer heat. They’re a great way to cool down, but you should never end up regretting your pool because of an avoidable accident. If you are moving into a house with a pool, here are 5 things you should do to stay safe. Putting up a pool fence with a self-closing, self-latching, lockable pool gate can help prevent accidents if young children attempt to swim unsupervised, and can deter unauthorized “visitors” from getting into your pool. A mesh pool fence is best because it’s difficult for children to climb and takes minimal effort to set up and take down. These strong and durable fences are some of the most popular and effective ways to promote pool safety at home. In some states, a pool fence is required, so your pool may already have a fence. If so, it may need to be checked to make sure there are no hidden problems. should learn basic first aid and CPR so that you will be ready if an accident happens. Always be ready to get out of the pool if there are warning signs of trouble like an approaching thunderstorm. The required maintenance is another factor affecting pool safety at home. Improperly sanitized water can be harmful. Keep the pool clean and have the water tested on a regular basis to make sure it has the right balance of chemicals. Pools also require routine maintenance to keep their filters clean and components in good working order. 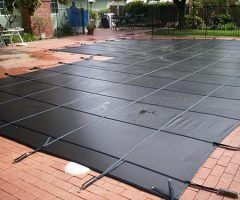 A good pool cover can help maintain pool safety at home while keeping leaves and debris out of your pool when you aren’t using it. 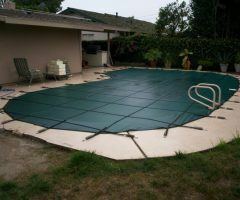 If you frequently have company over make sure everybody knows and follows safety rules even if a child might be upset that you’re not giving him or her free rein with your pool. Dealing with an angry child is better than dealing with the consequences of a tragic accident. Sometimes an insurance policy or the city code will require that you implement some extra safety measures that may seem unnecessary. The requirements may include the installation of a pool fence, an alarm, and additional safety features that can help keep unwanted guests out of your pool. These requirements reduce your liability risk. A good pool fence is a good start for pool safety and may prevent an accident from occurring when you’re not there. However, this is just the start of looking out for safety in and around your new pool in a meaningful way. Following these simple steps can help you prevent avoidable problems in and around your pool. A call to your local All-Safe dealer is the first step in securing your pool area with a reliable fence. A local expert will provide a free on-site consultation and quote, then work with you to install the best solution for your family. Call a local dealer today. ← How Much Is A Mesh Pool Fence?